Gardeners Hand Balm is one of our best selling products, which contains our own hand harvested comfrey. Great for this time of year for all gardening hands. Many customers are not gardeners, but love using this extra rich moisturising balm for restoring skin on all types of hands. after a few days application how different their hands feel. A little goes a very long way with the Balm. As it is so rich, only a small amount needs to be used in each application, and makes this an economic, as well as highly effective hand balm. We also have many customers who like to use this for hands that have rheumatism and arthritis as the comfrey and lavender in the balm can be extremely helpful for these conditions with regular use. We don’t use any preservatives in the Gardeners Hand Balm, as they are not necessary. We use organic rosemary extract as an anti-oxidant for promoting the Balms longevity. So you can be assured that you are using a totally natural product. The Gardeners Hand Balm is available in a 60ml glass jar, ideal for recycling. Ingredients: *helianthus annus (sunflower), ~symphytum spp. (comfrey leaf), *prunus dulcis (sweet almond), *cera alba (beeswax), *triticum vulgare (wheatgerm), *lavandula angustifolia (lavender), * pelargonium graveolens (rose geranium), *citrus limon (lemon), *rosmarinus officinalis (rosemary extract), citral, geraniol, citronellol, limonene, linalool. (from essential oils). 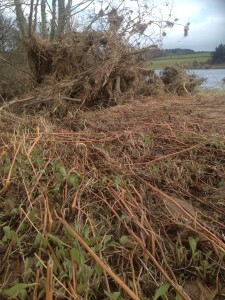 The end of December and start of January heralded some of the worst flooding in living memory in Aberdeenshire. Where we are living and working on the river Dee flooded causing great devastation along its entire length. In some cases local people have lost all their possessions and are unable to return to their homes for many mon ths, for some perhaps never. Farmers lost animals, and fields which were simply washed away Everyone was taken completely by surprise by the speed of the rising water, as floods had never been seen before to this extent. Wildlife and the environment, business and communities, roads and bridges, cars and transport – nothing was left unaffected. We went down to the place where we gather the comfrey leaves from their natural environment, on a private piece of ground near the river Dee, to survey the damage. 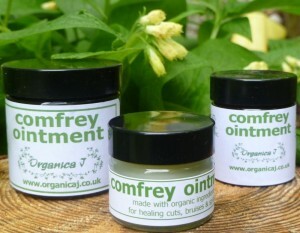 We use the comfrey leaves that we gather in our c omfrey oil macerate and in our comfrey ointment and other balms which contain our comfrey. We knew that the comfrey plants are strong and resilient plants, but were very pleased to see them growing up through the debris that had been left in wake of the river in spate. 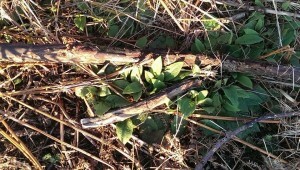 Areas where the comfrey plants grow, that normally would be unaffected by usual high river levels, were entirely under water during the flood. It is a great testament to the wonderful resilience of nature, that the comfrey plants and leaves are looking extremely healthy. We will be watching them closely over the next three months to see their progress to harvest time in April/May 2016. If you would like to help the people here after the floods, Aboyne and Upper Deeside Rotary Club is collecting through crowdfunding at the Ballater and Deeside Flood Relief Fund. After a good season with fairly long spells of dry weather (although not too warm here), we have now finished the comfrey harvest 2015. The comfrey plants are fine this year and because of the cooler weather, it makes harvesting easier as the plants in the sun are ready first.. We then progress to the plants that are in more sheltered areas, as they are ready later. The pictures are taken after the harvest, and as you can see we make no visual or environmental damage to this area of private ground in a wonderfully rural setting in Aberdeenshire, Scotland. At the start of the comfrey harvest 2014, we shot a little video to show you how untouched and rural the area in Aberdeenshire, Scotland is where we harvest the comfrey leaves each year to make our comfrey oil macerate. 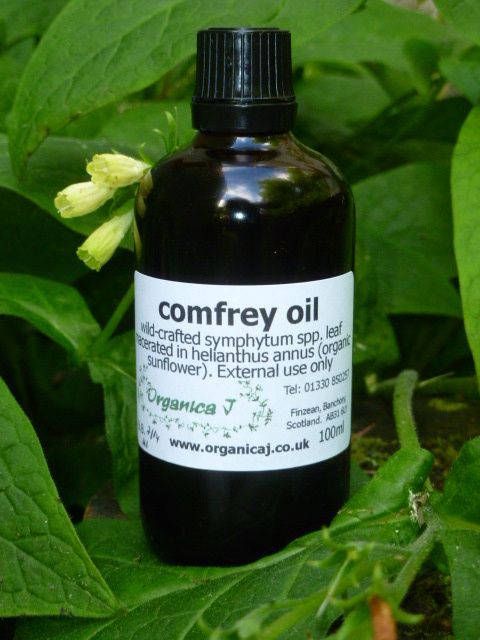 We then use the comfrey oil as a main ingredient in our comfrey ointment, gardener’s hand balm, herbal foot balm and the reflexology balm along with organic carrier, essential oils and beeswax. We are delighted to announce that the first batches of the fresh new comfrey oil macerate from the 2014 harvest is readyto buy now. It has been a fairly quick harvest season this year, and I love the quality of this macerate. 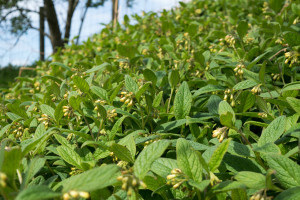 It is so green and full of goodness, which bodes extremely well for all the existing products that we use comfrey in – Comfrey Ointment, Gardener’s Hand Balm, Reflexology Foot Balm and Herbal Foot Balm, PLUS a new exciting product that I am in the process of developing – more news on that very soon.